Looking to America for culinary inspiration, I bring you an ice cream to wow your friends or guests. Brown sugar, caramel, and cream accentuate the Southern charm of bourbon. Crumbled caramel-cashew cookies add buttery sweetness and crunchy texture to this grown-up dessert. I wrote my first blog post several months before the launch of The Culinary Diplomat. Though it was not the first published, that post was about the best ice cream I’ve ever had (to date) – at Butter and Cream in Decatur, Georgia. So it’s fitting that at some point, the memory of their Bourbon Toffee flavor would inspire on of my own ice cream creations. This one holds its own and would make an excellent ending to a dinner party – or even Treat Yoself Thursday (Parks and Recreation reference)! While it’s not a dessert you can whip up spontaneously, a small amount of planning and time give you a no-stress culinary experience. I prefer to eat or serve this ice cream in a softer state, so chilling the finished product in the freezer for one to two hours and then serving immediately is ideal. It also makes a great ice cream sandwich! Instead of crushing and mixing the cookies into the custard in the ice cream machine, keep them whole and fill them with the finished ice cream before it hardens. It’s definitely not your childhood ice cream sandwich! In a medium pot over medium-low heat (just under medium), melt the butter. Stir in the dulce de leche or caramel and melt. Add a few tablespoons (about 2) of whipping cream and stir. Stir or whisk in the brown sugar to form a paste; add the remaining 2 tbsp. of cream (setting aside one cup). Add the bourbon and vanilla, stir to incorporate and allow to bubble/boil for about 5 minutes. The liquid’s volume should reduce slightly. Meanwhile, separate eggs and place the yolks in a small mixing bowl. Beat with a wire whisk (small bubbles should appear). Gradually add the granulated (white) sugar and beat until sugar is more or less dissolved. 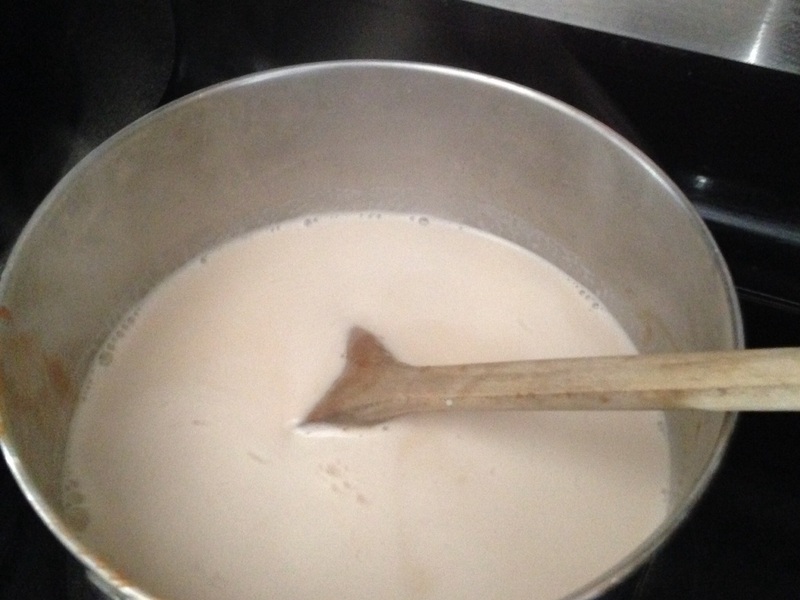 When the milk mixture has reached a boil, allow it to boil for 2-4 minutes; it should begin to expand or become frothy. Remove from heat. Pour about 1 cup of the milk mixture into the eggs, whisking in gradually to temper the eggs. Add in another cup of the milk mixture to the eggs, whisking continuously. Pour the resulting milk-egg mixture into the pot with the remaining milk and whisk in to incorporate fully. Cool the mixture for about 15 minutes. Cover and refrigerate for 1-2 hours or until thoroughly chilled. Whisk periodically if possible. You can shortcut the chilling by placing in the freezer for about 30 minutes, but stir/whisk every 5 minutes to prevent a skin from forming and the custard from freezing to the metal. Outfit your ice cream maker and pour in the custard. Follow instructions for your appliance. Crush 8-12 small cookies roughly to produce and uneven mixture of both crumbs and small pieces. 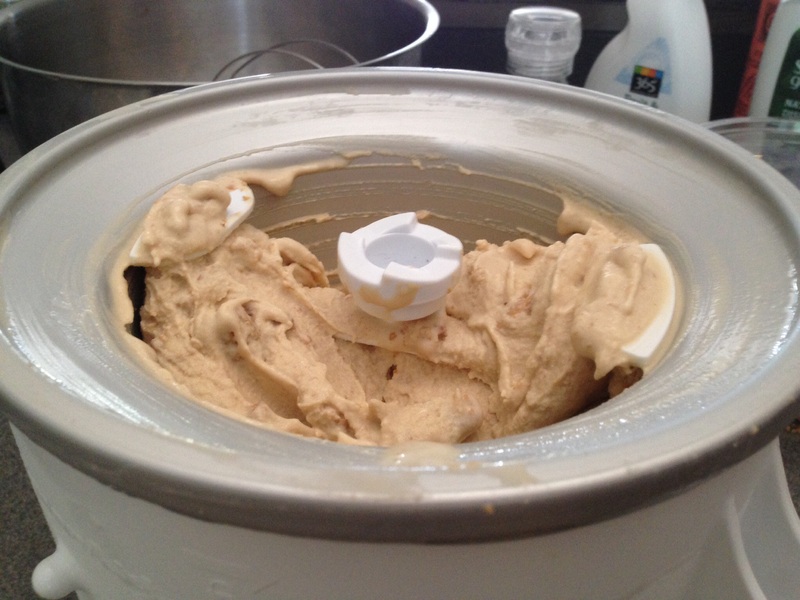 About 5-10 minutes from completion of churning, add in the cookies directly to the mixture and continue churning until complete. Alternatively, omit the crushed cookies and make ice cream sandwiches by placing the freshly churned, soft ice cream immediately between two individual cookies. Wrap tightly and freeze. *I used jarred dulce de leche (available at Trader Joe’s or in cans in your grocery’s Latin/International foods stores). I advise against using prepared caramel made for ice cream topping, as it is often made with quite a bit of unhealthy fillers, such as high-fructose corn syrup or preservatives and no butter or milk. Look for varieties with fewer ingredients, or make your own. 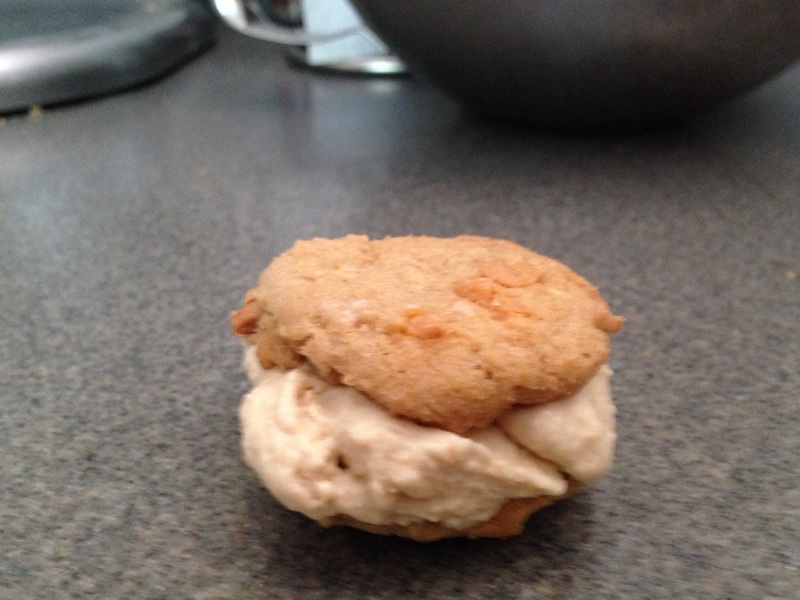 **I used Trader Joe’s caramel cashew cookies, which compliment the bourbon and caramel nicely, and they add a nice crunch. Vanilla wafers, crushed biscotti, chocolate chip, or even chocolate sandwich cookies could work as well. Use enough cookies to create about one cup of pieces/crumbs when crushed.